Super Smash Bros Ultimate has a staggering roster size, one of the largest of any fighting game ever made. Another Pokemon character is making their debut in the series as well, with the Litten evolution Incineroar entering the ring. Incineroar is an entirely new, and entirely different character. 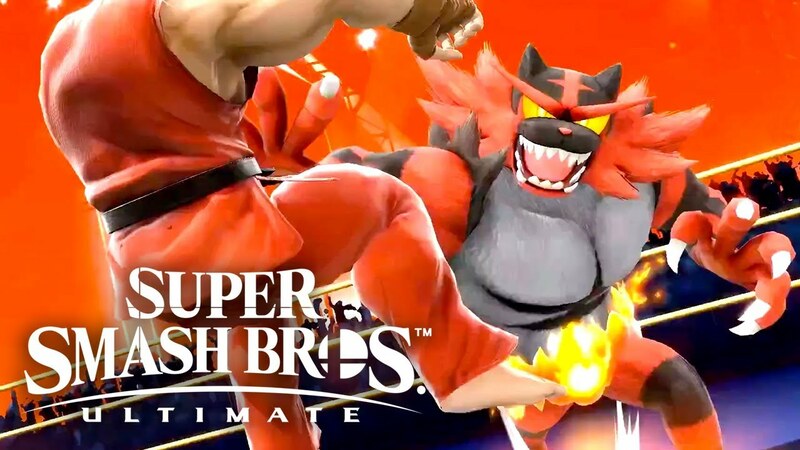 Here’s how to play Incineroar in Super Smash Bros Ultimate. As you might expect, Incineroar is a character entirely based around up close and personal combat. All of its attacks have to be executed at close range, and its smash attacks are particularly devastating. In particular, the character’s down smash created a splash that can cause damage on both sides of it. Neutral Special – Incineroar launches into Darkest Lariat for his neutral, spinning in place and hitting anyone that approaches on either side. You can tilt the control stick in either direction move to the side while you spins. Side Special – Alolan Whip. Incineroar dashes forward and grabs the opponent, then throws them behind him against a wrestling barrier and launches them high into the air. This is by far one of Incineroar’s most useful moves, and if enemies have significant damage on them this move can really launch them. Up Special – Cross Chop. Incineroar shoots up into the air diagonally and then plunges down violently at another diagonal. This Smash Bros Ultimate move has some serious power behind it, but it isn’t great for aerial recovery, especially considering if you don’t reach a ledge you’ll plummet to your doom. Still, Cross Chop has a meteor effect and the explosion it causes deals a ton of damage if you hit an enemy, so use it sparingly. Down Special – Revenge. A counter move, Incineroar strikes a pose and if an enemy attacks he turns the attack back on them and deals equal damage. Extremely skilled at close range combat, with powerful damage-dealing blows. Excels at throws and grabs. Heavy weight makes Incineroar harder to launch. Entirely close-ranged, doesn’t have any long-range attacks. Doesn’t have great aerial recovery. Poses after certain attacks for a few brief seconds. You can cancel these poses, but it can still leave you open to attack. A big thing to keep in mind while playing Incineroar in Smash Bros Ultimate is how much the character weighs. It’s still pretty agile, but you can see how much the weight affects the character when it’s in the air, as Incineroar drops like a ton of bricks. This is something you always need to keep in mind, especially when you’re trying to recover from getting launched. Incineroar’s main strength lies in its powerful throws and special attacks. However, these have fairly exact timing you need to nail. Throws are pretty self-explanatory, but Incineroar’s throws are strong enough to get a KO if an enemy is at a high percentage, where another character’s wouldn’t do so. Incineroar’s Alolan Whip is a great move to keep in mind if you’re playing on a level that has an upper platform. Damage the enemy a little bit, then grab them with Alolan Whip and send them flying for the KO. It’s also good to keep in mind that Incineroar’s down aerial in Smash Bros Ultimate is a meteor smash, so it can be hard to land but will launch the enemy if you do. They’re not the easiest character to use in the air, due to the weight problem, but Incineroar’s aerial attacks are just as powerful. Your rule of thumb when playing Incineroar is to stay on the offensive, but keep switching things up between regular attacks and grabs. By doing this you can keep the enemy on their toes and on the defensive. That covers all we can tell you about how to play Incineroar in Smash Bros Ultimate. Make sure to look at our Super Smash Bros Ultimate wiki for even more helpful tips and guides. You can also check out our how to play guides for other new characters like Ridley and Inkling.